If you head out Mahan Drive on the east side, just short of Capital Circle, you'll find the Meadowbrook neighborhood. Loaded with 3 and 4 bedroom homes near the median price point for single family homes, Meadowbrook got off to a very fast start last year. Of the 11 homes sold last year in this popular NE Tallahassee neighborhood, 9 were closed before the end of the first quarter. As of this writing, there have been two homes sold and closed in Meadowbrook, and there are four currently on the market (with two already under contract). Homes that are priced correctly in Meadowbrook are in high demand and sell right away, so if you find one you like and you know it's a good value, don't let it slip away to another buyer. 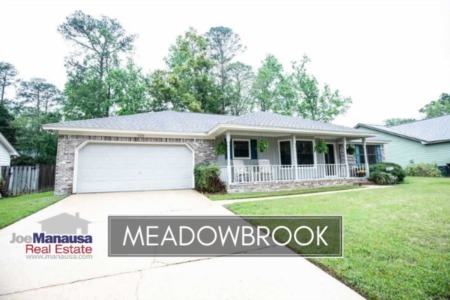 Both families and investors alike should consider Meadowbrook an excellent opportunity, as its eastern/central location will only continue to grow in demand as Tallahassee expands outwards. In this report, we will look at home price trends, home value trends, and home size trends in Meadowbrook, as well as show current listings in the Tallahassee MLS and all closed home sales going back to 1991. It is important to note that the narrative contained below is for sales through December for all previous years, but through the third week of February in 2016. The graphs and the closed sales table will be continuously updated into the future (meaning bookmark this page if you always want to know the current status of homes in Meadowbrook). Average home prices in Meadowbrook this year remain below $150,000, but don't expect this to be the case by year's end. The average recorded sales price is $139,500 now, and I suspect it will be well above $160K before the end of the year. The pace of sales has risen in the past two years, though we are still far below the levels seen in the 1990s. Eleven homes sold and closed in 2015, and two have closed so far in 2016. Average home values in Meadowbrook are still crazy-low. One might mistakenly believe that many of these sales have been distressed situations (short sales, foreclosures, bank owned properties), but this is not the case. The two sales this year were both "arms length" home sales, so these values are just insanely low. Through the third week of February, the average value of a home sold in Meadowbrook was been $89 per square foot, and that is a value that certainly cannot be matched by a home builder. If this is an area that you like and you get an opportunity to purchase a home for less than $100 per square foot, you better jump all over it. You'll feel like a genius when these are selling for $150 per foot in a few years. The average home size sold in Meadowbrook typically falls in a range of 1,550 to 1,850 square feet, and the smaller homes continue to be the popular ones with buyers. Thus far in 2016, the average size of the 2 homes sold has been 1,566 square feet. The following list of homes are the most recent listings in Meadowbrook. 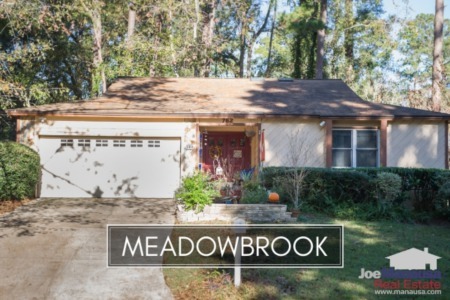 If there is nothing there, it means there are no active listings in Meadowbrook as of this time (remember, we update our listings 96 times per day, so this is as current as you can possibly find). I hope you enjoyed our February 2016 update on home sales in Meadowbrook, please feel free to drop me a note if you have questions not covered in this report. Real Estate Pro - Are You Working With One?